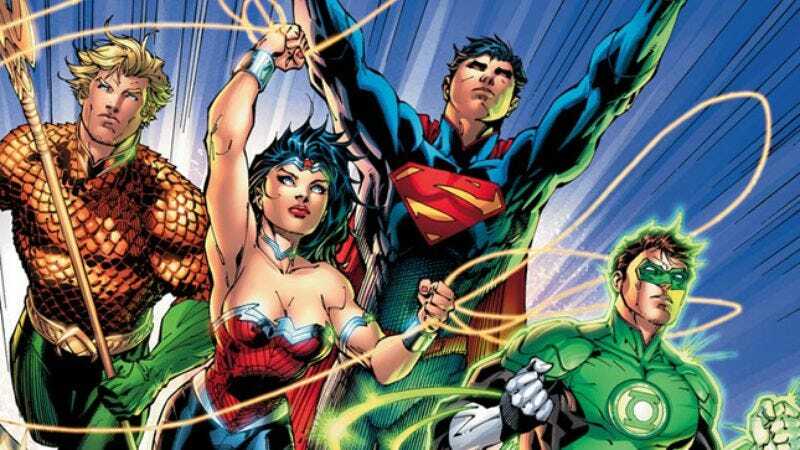 DC has embarked on the radical step of revamping its entire line of comics, rolling out 52 first issues beginning with Justice League on Aug. 31. Some are new titles. Some restart long-running titles like Batman and Action Comics. Some promise new concepts, while others offer new takes on old characters. Oliver Sava and Keith Phipps are reading and discussing all of them each week as part of an ongoing Crosstalk. Up this week: The final issue of the company-wide Flashpoint crossover series and the first title of the new DC: Justice League. Warning: There will be spoilers. Oliver Sava: This month, DC will re-launch each of its superhero titles with new continuity, new creative teams, and 52 first issues, an incredibly risky move in the current comics climate. The state of the national economy has taken its toll on comic-book companies, as many readers have been forced to cut down on the number of titles they buy monthly or have quit collecting altogether. The rise of digital comics hasn’t made it easy for retailers, and DC’s choice to release digital copies of each title on the same day as print has put a strain on the company’s relationship with the people they desperately need as allies. Jumping blindly into 52 new titles is a lot to ask of someone, and this summer’s Flashpoint event tested the waters by releasing more than 20 tie-in books of wildly differing quality. If the future of the DC universe is going to look anything like the past three months of Flashpoint, get ready for a bumpy ride. With a few exceptions, the books were plagued by inconsistent art teams and inconsequential stories, which is par for the course when it comes to event tie-ins, but is inexcusable when the main title disappoints as heavily as Flashpoint. For a book spotlighting a speedster, it sure does take a long time for anything to happen. By the time the characters stop discussing the mechanics of their alternate timeline and actually do something, the series is already more than half over. Keith Phipps: I definitely want to get into Flashpoint, whose main title I think I enjoyed at least a little more than you did. But before we do, we should talk, if only briefly, about the motives behind the reboot. DC Co-Publisher Dan DiDio has said he’s wanted to do this for a long time and, in retrospect, crossover events like Infinite Crisis and Final Crisis feel like series that walked right up to the line of restarting the whole universe, then blinked. DiDio is someone who’s reshaped DC in his own image since joining the company in 2002, as a strong publisher should. He’s been a controversial figure, unafraid to make bold changes and let fans argue about them later. The 52 reboot, or the DCnU as it’s being called, is his boldest move yet. He’s not the sole driving force behind it. Co-Publisher/superstar artist Jim Lee and the extremely busy writer/Chief Creative Officer Geoff Johns—to my eyes the best writer out there when it comes to revamping established characters, but we can get into that later—are also central figures. But the other main player behind the DCnU isn’t a person at all; it’s the market. Comics sales—at least when it comes to the monthly issues—have been in decline for a while, and this reboot, coupled with the day-and-date-with-digital strategy, is an attempt to reach new readers while keeping up with changing technology. So let me ask you this, Oliver, before we get into the quality of the books themselves: Are iPads the new spinner racks? Do you think the new DC will find new readers? OS: Getting comics in more hands is always a good thing, and digital distribution is easily the best way to get the books to more people, but how many kids have iPads? Or credit cards for charging their digital purchases? The digital move is good for adults, but I don’t see it bringing in a lot of children. Granted, I’m not sure that’s who these books are aimed at, as the past few years of DC titles haven’t been very kid-friendly. (One of the kid sidekicks from Super Friends got eaten by a demonic Wonder Dog in Teen Titans, a book that should be a refuge for younger audiences.) DC needs to convince parents that these books are worth the $2.99, which is a lot of money to spend on a comic that probably won’t last long past the 20 minutes it takes to read. They’re not going to do it by publishing books with women taking vomit-blood showers on the cover. In terms of being new-reader friendly, Flashpoint was somehow mired in continuity while being simultaneously stripped of it. If you’ve been reading The Flash for years, all the time travel/speed force/Professor Zoom nonsense is easy to swallow, but I can’t imagine how the story reads to someone unfamiliar with the circumstances leading up to it. In Flashpoint #1, Barry Allen wakes up in a new world and he’s all confused, some guy named Cyborg is meeting up with a bunch of people that look kind of familiar, and Batman is actually Bruce’s dad. That seems easy enough. Then #2 is an extended teaser for the slew of tie-ins, with Barry explaining his situation to Batman. The wave of exposition about parallel Earths and altering history just kills the momentum of the story. Nothing is happening, but if you want some action, you can pick up 60 other books this summer! Then there are the ridiculous sequences of Barry electrocuting himself to get back his Flash powers, which are supposed to be endearing but just read as psychotic. Issues 3 and 4 are the “Let’s get the team together” issues (Superman is skinny and pale! Whoa! ), and the last couple pages of #4 are the big battle that all the tie-ins have been building up to—and it turns out that’s all they were building up to. The last issue doesn’t offer any sort of satisfying conclusion to the Flashpoint storylines; it just does some more explaining. Barry faces down his arch-nemesis, Professor Zoom, who reveals that the entire Flashpoint universe was caused by Barry when he traveled back in time to save his mother from being killed by Professor Zoom. They talk-fight, some characters die around them, and Batman stabs Zoom through the chest, ending the explanation and beginning the retcon. Barry runs through time, spending one last moment with his mom before stopping his past self from preventing her murder, and while I appreciate that Johns tried to bring some emotion to the story with Barry and his mother, the entire plotline seemed like an afterthought. When the two Barrys collide on the cosmic treadmill (God, superhero comics really are absurd), a mysterious female pulls him through the speed force to tell him the Vertigo, Wildstorm, and DC timelines must converge to face an impending threat, and then it’s the new universe. I knew we weren’t going to get a “logical” story reason for the DCU to be revamped, but throwing in a new character last minute as the catalyst is just lazy. There are some things I like about Flashpoint, but those are tie-ins that have little to do with the main story, instead focusing on how the fundamental ideas of each character change with the altered timeline. Brian Azzarello and Eduardo Risso’s Batman: Knight Of Vengeance is an inspired twist on the Batman/Joker relationship, with Bruce getting gunned down in Crime Alley and his parents taking on the two roles that would otherwise dominate their son’s life. Project Superman reads like a forgotten tale from J. Michael Straczynski’s Supreme Power, and the interactions between Lois and Kal as children are surprisingly heartwarming considering the bleak tone. Jeff Lemire’s pulpy combination of war and monster comics in Frankenstein And The Creatures Of The Unknown has me excited for the new ongoing series, but even that suffered from artistic inconsistency toward the end. What exactly did you like about Flashpoint, Keith? The more time I spend with it, the more inconsequential it all feels. So here we are, back at the beginning. Well, technically we’re “Five Years Ago,” as the caption says, which I’m assuming is five years prior to the last issue of Flashpoint. Superheroes are new to the world. They seem to have appeared at around the same time. And they don’t like each other. Written by Johns (again) and drawn by Lee, it looks like the first arc of the new Justice League will retell—and revamp—the story of how DC’s premier supergroup came together. We see Green Lantern meet Batman. They fight the police, quarrel with each other, learn their enemy is someone named “Darkseid”—apparently a new name to them both—head to Metropolis, where the star football player/future Cyborg Victor Stone watches their arrival, and then, finally, confront a peevish Superman. In fact, everyone’s pretty peevish in this book. Johns is capable of writing nuanced characters, but this is a book of high bluster and bad attitudes. If this is the new norm—if, in other words, we’ll be watching a bunch of superdicks from here on out—I don’t like it. But it does make sense within the context of the story, and I’m willing to trust that Justice League won’t be a bunch of chest-thumping from here on out, and the rest of the DC Universe will follow suit. For now. It’s tough to judge a superhero comic from its first issue, even tougher than trying to judge a TV show from its first episode. Because of the episodic nature of comics, and the decompressed storytelling that’s become the dominant form over the last 10 years or so, it’s almost like trying to assess a show based on what you see before the first commercial break. With that in mind—and it’s good to keep that in mind as we go through all 52 first issues—what can we say about Justice League #1? I’ll start off: It’s gorgeously drawn, fast-paced, and maybe just a little too thin for its own good. But I’ll definitely be coming back for more. And if the goal was to provide a hooky, light, let’s-get-things-started issue for new readers, I’d say it’s mission accomplished. How about you, Oliver? OS: It’s the danger of writing for the trade; the first issue of a new comic reads like the first 10 minutes of a TV pilot. If they’re going to throw a “Five Years Ago” on the first page, couldn’t they have at least started off with a couple of pages of the full team in action, then flashed back? I’m eager for the team’s origin to be done with, because it’s a story we’ve read so many times. This issue is more action-packed than Superman, Batman, and Wonder Woman sitting around a table with every superhero’s headshot, but it still reads on the lighter side. I’m most interested in Cyborg’s story, the only part of the issue that felt personal, but the presence of the Flashpoint mystery woman in the background of page 18, panel two, is keeping me nervous. The ending of Flashpoint indicates that the bad attitudes will eventually go away as future arcs of Justice League occur in the present, and I’m hoping that Johns spends less time on establishing atmosphere and more time on an actual plot. DC should have kicked off the line with a graphic novel of Johns and Lee’s entire first storyline. It’s not like there are any other books to pick up from the company that week except Flashpoint. It would spare us six months of slogging through yet another Justice League origin, and release the book in a format that could be stocked on bookstore shelves. Alas, Jim Lee probably can’t produce 100 pages and then churn out a monthly book, at least without more than a year’s lead time. What are your opinions on Jim Lee, Keith? I think he’s the best of the original Image creators, but like the rest of that group, he’s more suited for action than emotional storytelling. This issue plays to his strengths: the fight choreography is hectic but fluid, and the characters all look appropriately macho and serious. Lee’s character designs work fine under his pencils, but it will be interesting to see if other artists will be able to make all that extensive piping look like part of a costume rather than a bunch of extra lines everywhere. Artistic consistency is my main worry about the new DC, as Flashpoint showed that DC is willing to switch artist teams mid-run to make sure the books come out on time. Blackhawks and Mister Terrific have already had multiple art teams solicited, and names like Rob Liefeld and David Finch don’t inspire much confidence. I hope that this endeavor proves to be successful for DC, but Flashpoint and Justice League have me feeling more cautious than optimistic at this point. We’ll see if writers like Morrison, Snyder, and Simone can restore my confidence, and here’s hoping they do. KP: I’ll start with your Jim Lee question: Lee’s grown on me over the years as his art as changed. It was the Image era—with its anatomically challenged heroes rendered in absurdly intricate detail and its nonstop x-tremeness—that drove me away from superhero comics in the first place. Lee was never the worst offender—cough, Liefeld, cough—but he was also never a favorite. Over the years his art has grown more nuanced and a lot, well, prettier, particularly as he’s found sympathetic inkers and colorists. Lee art is never enough reason for me to pick up a book, but I do like it now. Geoff Johns, on the other hand, is usually reason enough for me to pick up a book (apart from my weird Green Lantern block, which I suspect we’ll get into down the line). He has a deep affection for the characters and their history and writes clear, compelling stories. This issue played more to the strengths of the artist than the writer. I’d love to wax rhapsodic about it. I can’t do that, but I can easily call it a solid overture for what’s about to unfold. As for the rest of the line: Color me more optimistic than cautious (but definitely still cautious). I think DC knows just how much it has on the line here and is pulling out all the stops to make sure the trains run on time and turn out the highest quality books it can. Some of the creators and concepts interest me more than others, but I’m still looking forward to reading each title, even if I know I’ll only be reading some of them once. Whether it’s a desperate stab to reclaim relevance to a wider audience or the first chapter in a new history, we’ve reached a unique moment in comics history. Next Week: Grant Morrison on denim-Superman in Action Comics, Barbara Gordon gets out of the chair in Batgirl, and Stormwatch brings Wildstorm into the DCnU.